Linda Darling-Hammond, who served as education advisor to President Obama’s 2008 presidential campaign, is currently developing assessments for our new national curriculum, the Common Core State Standards. Darling-Hammond is a long time advisory board member to the National Equity Project, formerly known as the Bay Area Coalition of Essential Schools and the Bay Area Coalition for Equitable Schools (or BayCES). The National Equity Project/BayCES opened in 1991 as a regional office for Theodore Sizer’s Coalition of Essential Schools (CES). CES is an outgrowth of the Annenberg Institute for School Reform at Brown University and is the progressive reform movement behind Common Core. 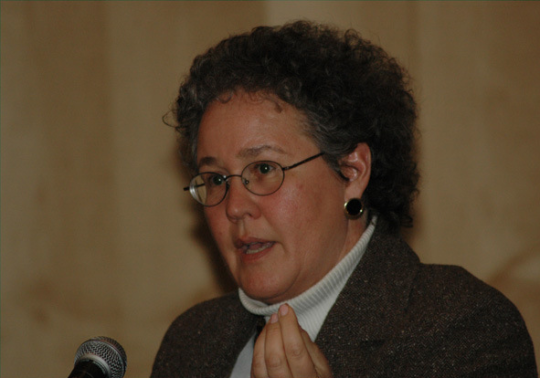 Through an organization she co-founded called the School Redesign Network, and through the National Equity Project/BayCES, Darling-Hammond has worked closely over the years with socialist, Deborah Meier, communist, Bill Ayers, and several ultra-liberal organizations, including the crooked and recently de-funded ACORN, to open new progressive schools and transform existing public schools into progressive indoctrination centers. This reform effort was once widely known as the ‘small schools initiative’ or ‘small schools movement’. To read more about Meier and Ayers, look for them at the Name Names page. The most liberal school systems in our country today known for political and social indoctrination are districts that dove head first into CES/small school reform years ago and remain there today. Namely, Chicago Public Schools, New York City Public Schools, Oakland Unified School District, and Seattle Public Schools (among others). Today, the National Equity Project’s main focus is addressing “race and class-based gaps in achievement… resulting from historical and institutional biases”. In short, ‘white privilege’. Darling-Hammond has long been an advocate for repaying what she refers to as “an education debt” owed to African-Americans, a view fostered by many radical educators, including Obama friend, the late Derrick Bell, who was also an advocate for reparations for slavery. The National Equity Project provides ‘equity coaching’ to educators in numerous school districts nationwide. This is the same equity coaching that brought us the ‘peanut butter and jelly sandwich is racist’ mentality that made news last year. Darling-Hammond, who also had a hand in the creation of the controversial CSCOPE curriculum in Texas, recently endorsed the American Humanist Association’s Ten Guiding Principles for Teaching Values in America’s Public Schools. These principles include global awareness, a commitment to the United Nations Declaration of Human Rights, social justice, and service to an ‘interdependent world’. Read more about the ‘education debt’ here. Also, see the other faces behind the Coalition of Essential Schools at Name Names.